The KC-130 – One of six C-130 variants included in v4.3! The next update for Prepar3D v4 is here! 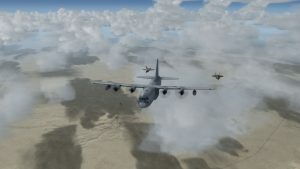 Prepar3D v4.3 takes simulation to the next level offering new features including interactive panel windows in virtual reality (VR), improved scenery dynamic lighting performance, several new C-130 user-selectable aircraft, as well as numerous user interface (UI) enhancements, various stability and performance improvements, multiple bug fixes, and much more. In addition to the numerous core features and enhancements, Prepar3D’s open development architecure keeps expanding with multiple new updates to the Software Development Kit (SDK). Developers have even more power and freedom to create new and exciting content blurring the lines between simulation and reality. Additional tools are available including the ability to place windows and panels in 3D space, improved scenery placement accuracy, as well as multiple new services, functions, and callbacks with even more robust error reporting and handling. The Professional Plus version also features many updates including basic support for Common Image Generator Interface (CIGI) version 3.3 and 4 along with numerous improvements to the Distributed Interactive Simulation (DIS) interface. Multiple improvements have also been made to SimDirector, Prepar3D’s built-in advanced scenario creation tool, including AI enhancements, trigger and validation improvements, greater stability, and improved usability. The Prepar3D v4.3 update is available now and can be downloaded from the Downloads page. If you currently own a valid Prepar3D v4 license there is no charge to update to Prepar3D v4.3. To purchase Prepar3D v4, please visit our online Store. Prepar3D offers separate updates for the Client, Content, and Scenery. This will make updating faster and easier than ever before. Please be sure to read the Prepar3D v4 Download and Installation Instructions for more details on how to quickly update to the v4.3 release. Please refer to the What’s New below to see what each installer contains. Most users will only want to use the Client installer to update. The following list of updates has been categorized based on the installer required. The Client installer is required for Prepar3D v4.3, however the Content, Scenery, and SDK installers are optional. You must first have Prepar3D v4 installed to utilize the Client only installer. To install the Prepar3D v4.3 Client, you must first uninstall the previous Prepar3D v4.0/v4.1/v4.2 Client through Programs and Features in Windows Control Panel. The Prepar3D v4.3 Client update will require you to reactivate your product, however if you have an internet connection it will be automatic. Please view the Prepar3D v4 Download and Installation Instructions for more information. Vehicle panels can now be used in VR. Window Definitions can now be created and applied to Prepar3D windows. Added Scenery Library and Add-ons to the Startup Screen. Added interactive Map to the Airport Selection Screen. Added basic Common Image Generator Interface (CIGI) support. Distributed Interactive Simulation (DIS) entity appearances can now be customized per bit via XML file. Fixed issue where right clicking the ATC and closing would cause the ATC window to reopen on a view change. Fixed inaccurate heading when broadcasting to ForeFlight. Invalid camera settings no longer save out when saving in VR. Various VR Performance improvements increasing overall framerates and stability. Virtual Cockpit (VC) rendering performance improvements. Fixed visual bug where UI windows would flash at the wrong location when opened. PreVC post processing optimized with new VC rendering techniques. Updated Colorizer post process to correctly use stencil buffer. Fixed numpad view panning when using SimConnect applications. Fixed rare bug in Oculus initialization that could cause visual anomalies. Fixed visual errors when using Oculus with SteamVR. Fixed VR issue which prevented the proper single pass stereo mode from updating based on settings. Fixed bug preventing the ShowMessageText setting from persisting. Fixed issue with undocked views not focusing and accepting input when closing their context menu. Fixed bug preventing add-ons from loading properly with trailing slashes ‘\’ in file paths. Added a VR settings UI screen and reorganized VR menu items. Oculus VR headsets can now be used with SteamVR. Added VR emulator option to test VR without having a headset connected (requires installing SteamVR). Cinematographer camera movement speed is now updated based on joystick sensitivity settings. Fixed issue that could cause the ATC window to be disabled unexpectedly. Fixed issue that caused keypresses to be processed on SimConnect menu windows when opened. Zoom is now available in VR. Installer is now digitally signed. Fixed crash that would occur in vehicles with a large number of VCockpit panel entries. SimConnect menus no longer register for key presses larger than the menu option count. Reduced lag when opening context menus. Fixed bug where numeric keypresses to SimConnect windows would also be sent to the main application. Custom camera menu items are now displayed in their view category and can be applied to views when opened. Deleting a custom camera now only resets views that had that specific custom camera applied instead of all views in that category. Default settings for VR, ViewGroups, and Multichannel are now written out to configuration files. Added reset camera menu option in context menu and menu bar. Reset also reapplies custom camera values if set on the view. Updated default zoom levels for cockpit and virtual cockpit entries to 0.3. Fixed issues with certain sensor views in VR singlepass with MSAA enabled. Fixed bug that caused voice communication issues over multiplayer. Added -rolename command line option. This lets users specify the rolename for multiplayer scenarios. Startup screen is no longer displayed when using the -net command line option. Both structured and unstructured scenarios can be selected when booting directly into multiplayer using the -mp command line option. Fixed visual issues with focal points. Placed dynamic lights are now processed in clusters with additional distance-based checks improving performance. Added ability to create custom voice control phrases from VR. Renamed Selection key events in the Controls UI to Selection/Zoom so that the key binding for zooming is easily searchable. Added magneto increment/decrement to Controls UI. Removed redundant work in water texture processing. Fixed hybrid unit display errors in UI. Added checkbox for disabling cockpit momentum effects. Fixed margin errors, tooltips, and minor visual bugs in several UI screens. Fixed issues where custom scenery could cause invalid data to be written in land classes. Fixed bug where secondary view group windows would not fully expand to the left and right of the display. Fixed bug where maximized windows on secondary monitors would not cover the taskbar in full screen on Windows 10. Fixed bug with vehicle doors opening after a SimConnect menu was opened. Added additional fallback case when loading control mappings to disregard any GUID in the title. This is useful when exporting controls on one machine and importing on another where GUIDs may not match. Fixed resizing issues with the timer panel. Changed default observer focus type to local instead of world. Updated installer to reduce potential hangs when installing DirectX. Fixed enter key not working with Activation UI windows. Fixed crash when opening the Save UI if any installed aircraft were missing titles in their aircraft.cfg. Fixed crash when originalID was missing from scenario file. Updated generic buildings to do more accurate position calculations. Redesigned the Custom Camera UI. Fixed bug where sensor mode would not be cleared when removing IR post processes from views. Post processes no longer render one additional frame after being removed. Fixed error preventing email activations from persisting on restart. InfoGen is now updated in panel only views. Fix bug with rotatable landing light PBH in ISimObject vehicles. Fixed Flight Planner UI bug with cruising altitude not automatically being calculated after a departure/destination is selected. Fixed collision bug with avatar. Distant vehicles are more accurately displayed. Fixed bug where VC only views would be white when set to the starting view in a scenario. Fixed issue preventing User Interface windows from blacking out the application on newer versions of Windows 10. Fixed bug where Payload UI would save changes when pressing escape. Fixed issue with attached effects that could cause them to disappear at certain viewing angles. This also affected attached dynamic lights. Fixed turbo prop shaft torque time constant preventing errors causing incorrect net negative torque values. Fixed crash that could occur when crashing vehicle. Fixed issue preventing the host machine in multiplayer from correctly serializing content to client machines. This would occur when the host did not have content that connected clients had. When multiple UI windows are open only the window accepting user input is enabled. Improved handling of autogen extrusion object intersections including bridges. Fixed bug which could cause night terrain textures to be incorrect for one frame in some cases. Fixed potential infinite loop when two or more DIS entities were colliding. DIS articulated parts and entity appearances are now configurable via XML file for both native objects and ISimObjects. Fixed audio choppiness when using DIS radios and intercoms. Fixed bounding issues when zooming with double click in SimDirector. Fixed bug causing SimDirector to lock up when canceling out of the SimOperator UI. Fixed crash that would occur when closing SimDirector when starting Prepar3D in SimDirector mode. Fixed bug where SimDirector icons would not render with post processing disabled. Improved tab key handling in SimDirector catalog view. Windows in SimDirector can now be activated using the keyboard by pressing Ctrl + Tab. Fixed bug where the SimDirector window title text would not display file names containing multiple periods correctly. Added “ShowText” property to Dialog Actions. Added clarification to goal objects to highlight that completed goals can still be failed. Fixed bug where wingman behavior would still move AI when position freeze all was active. The current AppVersion will now write out to fxml from SimDirector instead of the loaded scenario’s AppVersion. Added confirmation prompt when exiting SimDirector. The AirportLandingTrigger IDENT field now correctly validates against all airport ICAOs and is treated as a validation error instead of warning. Fixed SimDirector bug with Zoom Mode resetting to Standard after pressing shift while in Precise mode. Fixed bug where opening the Select Vehicle UI would cause all placed objects to disappear. The SimDirector window position and size now persist when switching between modes. Fixed issue with mouse look behavior for docked views in SimDirector Preview mode. Removed duplicate sound in AIM-120 missile. Fixed issue that caused Jet Fighter 27 and 29 to appear as selectable vehicles. Model and texture updates for the CH-53. Removed broken duplicate firetruck SimObject. Some Scaleform mission panels were missing window_size cfg entries leading to sizing errors in some cases. Fixed missing sounds for several AI ground vehicles. Updated CH-53 and UH-60 exterior models with more accurate crash boxes. Fixed scenery errors causing trenches to appear along Cyprus. Fixed elevation and exclusion issues at YBUD. Fixed elevation issues in Guam. Added American Elm and Acacia mild winter SpeedTree variations. Target frame rate can be applied to specific cameras in camera configuration files and through the PDK. Added TextEventDestroyed SimConnect notification for when text windows are closed. Windows and panels can be positioned in 3D space using the PDK. Added damage state variable to ModuleSim. Variable can be set via scenario, PDK, or SimVar and will be serialized in multiplayer. Developers can use this variable to control model appearances. Added 3ds Max 2018 support. Added PreScene pass to SDK for custom render objects. Changed several QueryBaseObject interfaces to return void** instead of the specific version in the PDK. Fixed build error in SimpleHelicopter PDK sample. Updated SDK to have input stencil available for the PreVC render pass. Stencil flag added to primitive drawing. Added attachment SetOffsetFeet and SetOffsetRadians functions to the PDK. Added create and destroy callbacks for effects to the PDK. Added pylon accessibility to weapon system PDK. Fixed crash that could occur on shutdown if execute_calculator_code was called from within panel callbacks. Fixed light SimVar inconsistencies and added Headlight, Brake, and General Light key events. FLOAT2 has been added as a Simprop type/property option. Added content error report for missing models. Improved content error reports for DLL loading errors. Aircraft panel folders will now take priority over global gauges folders. Fixed file path bug with SimConnect_CaptureImage. Fixed SimConnect_OpenView to open a view with the correct camera and window title. Corrected rotation issue when setting attachment orientation. RUDDER POSITION SimVar now settable on GroundVehicles. Fixed error preventing ISimObjects from signalling weapon fired events. Fixed various camera sensor mode SimConnect functions. Fix edge case in PDK callback list that could cause a crash on shutdown. Added function to change the color of the AG radar scan. Added several new SDK samples. Add GetDeviceWindow function to IRenderingPluginService. Fixed window focus bug when opening an observer view with SimConnect_OpenView. Fixed issue where SimConnect data requests with the same definition ID would collide even though they were different request types. We hope you find that Prepar3D v4.3 continues to be the most immersive learning, simulation, and training platform available.